An East Yorkshire college has been given permission to radically change its main campus in Bridlington. East Riding College's existing campus on St Mary's Walk is to be knocked down and replaced with a new 65,000 square foot two-storey building. 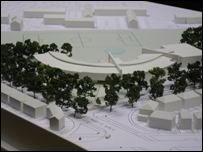 Building work is expected to start in January after the plans won permission from East Riding of Yorkshire Council. The move is part of a £40m project which will also see the relocation of the college's Beverley campus. John Doris, the college's director of resources, said: "We are very pleased with the way the plans are progressing, and look forward to becoming even closer towards achieving our ambitious plans." The new Bridlington campus will be built on the open space in front of the existing building and is expected to be completed in the summer of 2009. The planned date for the move of the Beverley campus is summer 2010. The location of the new site has not yet been confirmed. The redevelopment works are being funded by the Learning and Skills Council.